Fatigue, sluggishness, stomachaches…. Many people experience these symptoms — and more — on a regular basis. While there are many possible reasons, it could be due to liver congestion! The liver is one of our “detox organs.” Its job is to filter all the toxins that we are exposed to on a daily basis, so that they can be safely excreted. Unfortunately, in our modern world, there are so many toxins that the liver can become overburdened. They’re found in our air, water, and food. It’s hard for the liver to do its job when there is so much to handle! When the liver is overburdened, it can become congested. When it does, it’s no longer effectively filtering out those toxins, which can stay in a person’s system or get stored in fat (to protect the body). This can result in lots of different symptoms! Although these may also be signs of other issues, liver congestion underlies a lot of different problems that people face! When the liver can’t break down excess hormones, clear toxins, produce bile, etc. then the body can’t digest food well and absorb nutrients, maintain hormone balance, have energy, and so on. The liver plays a huge role in a lot of what the body does. One of the liver’s jobs is to break down excess hormones in the body. Your body is constantly producing new hormones (chemical messengers) that tell your body what to do. Once those hormones have done their jobs, they need to be broken down and excreted. But when the liver is congested, that doesn’t happen — and too-high levels of some hormones can circulate. Many women who are struggling with estrogen-dominance or other hormonal issues have congested livers. Some pregnancy issues are related to congested livers, too. Itchy rashes like PUPPS, cholestasis, possibly even pre-eclampsia. These are all signs that more liver support is needed! Skin issues are often due to liver congestion. If your body can’t detox through your liver like it’s supposed to, it will push stuff out through the skin. This can lead to acne on the face or body, flares of eczema or psoriasis, or other minor rashes. Basically, if your liver isn’t functioning, there are a lot of possible problems that can happen! And no matter what issues you are addressing, if you don’t support your liver, they won’t be as effective. For example. Many people make this detox mistake — leading to cleanses or special diets causing more harm than good. Okay, now that we’ve covered why liver support is so important, let’s talk about how to do it! Drink plenty of fresh water! Without water to help things stay lubricated and move easily, our bodies do not detox effectively — including our livers. 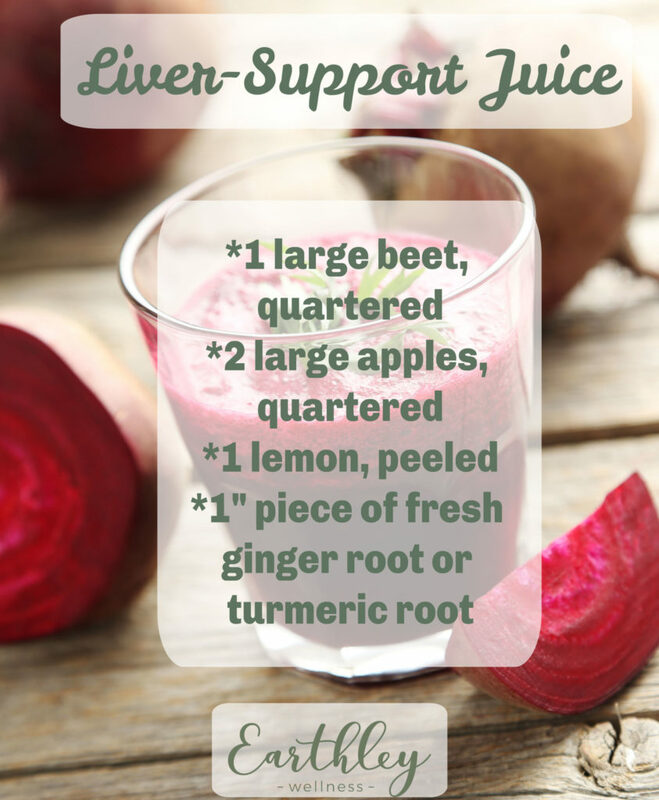 Beets are pretty much a super food when it comes to liver support. They have antioxidants, can help to breakdown excess fats, are anti-inflammatory, and more. Enjoy them whole, or try juicing them with apples and lemons (both of which are also good for liver and gallbladder support, plus make the juice taste good). See the recipe on the image above! This “wonder drink” is made from fermented sweet tea, and contains several different organic acids and high levels of B vitamins. It helps to gently support and detox your liver. Just make sure to drink plenty of water with it, and start slow if you’re not used to it. While kombucha can be expensive to buy ($3 – $4 for a 16-oz. bottle), it’s very cheap to brew. Check out my video on kombucha brewing. Milk thistle contains a bioflavanoid called silymarin, which helps to support and detox the liver naturally. It’s used even in the mainstream for liver issues. It’s best to either take ground milk thistle powder capsules, or to take an alcohol-based extract. Silymarin isn’t water-soluble, but is alcohol-soluble. Turmeric contains a compound called curcumin, which is a powerful anti-inflammatory and antioxidant that can support liver health. It also support gut health and heart health, so it’s an all-around awesome choice! Besides drinking kombucha and fresh water regularly, one of my favorite ways to support the liver is with this Liver Love extract. I formulated it in the fall of 2017, and it has helped my husband so much when he is dealing with signs of liver congestion. At one point, he was getting migraines that seemed to be related to liver stagnation, and natural pain relievers didn’t touch it. But Liver Love took care of it! Liver Love is an alcohol-based extract of turmeric, milk thistle, black pepper, peppermint, and dandelion root. All the ingredients are organic, and the alcohol is derived from sugar cane — not grain. Support your liver…and experience better health! 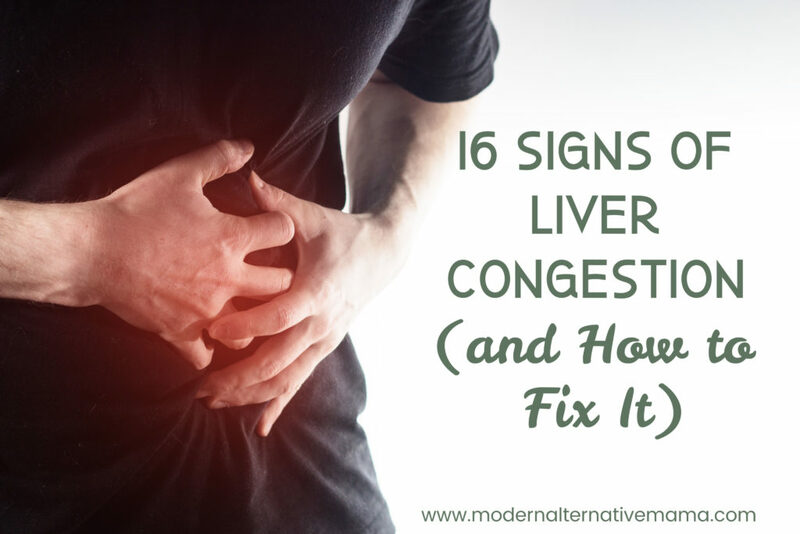 Have you dealt with liver congestion? What worked best for you? Can you take liver love while breastfeeding? It is recommended to use with caution while pregnant or nursing, as peppermint may cause contractions or affect milk supply in sensitive women.